It’s Clayton Kershaw topping the ERA list once again midway through this year. But this time, he has some stiff competition that has him one more faulty start away from losing his grip on the top spot. Kershaw’s ERA jumped from 1.57 to 1.79 after his last start in Pittsburgh, where he gave up 4 earned runs in 6 innings, walked 2 and only struck out 4. The start was pretty mediocre, but for Kershaw, it was essentially a disaster. On top of the “rough” outing in late June, he then went to the DL with a lower back injury that may sideline him for a little while. But Kershaw still sports a sub-2 ERA and .73 WHIP, which is also best in the NL. Madison Bumgarner, on the other hand, steam rolled into All-Star weekend by tossing a complete game 1-hit shutout against the division foe Arizona Dimondbacks. Oh, and he struck out 12 in his first 6 innings, 14 for the game. His masterpiece dropped his ERA below 2 once again, to the current 1.94, and he appears to have everything working again. He had mentioned earlier in the year that he had found his mechanics, and he is throwing his cutter more and his curveball less for much greater effectiveness as seen in his .96 WHIP (also 2nd best in the NL). 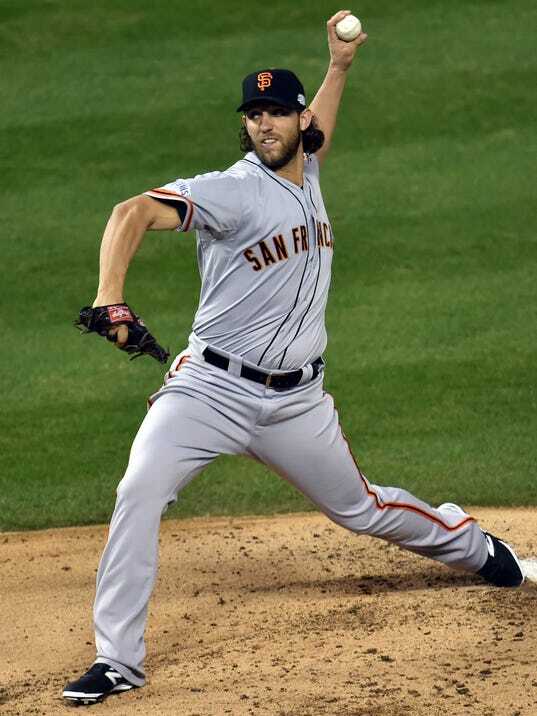 MadBum looks as good as ever, and its only July. Here comes Johnny: Johnny Cueto has seen a resurgence out west with the Giants this year, certainly doing his part in helping his team to the best record in the Majors thus far at 57-33. Cueto’s sparking 13-1 record is bolstered by his 2.47 ERA, good for 4th best in the NL, but even that is inflated by a rough outing in Philly where he gave up 6 earned over 6 innings (ERA jumped from 2.06 to 2.42). Jake Arrieta is having a bad year; If you rely on social media for your sports opinions. His 12-4 record and 2.68 ERA are merely mortal, I suppose, while leading the Cubs to the 2nd best record in the NL at 53-35. He has absolutely struggled of late, particularly with his command, but he earned the 12-4 record with an impressive arsenal of pitches that we marveled at just last year. Stephen Strasburg became the first pitcher in the NL to start 12-0 since 1912, and is just the second pitcher in the MLB to start 12-0 in the last 30 years (Max Scherzer, 2013, 13-0). His 2.62 ERA and minuscule 1.01 WHIP combined with 132 K’s prove he is earning each and every win his resume boasts. Despite his short DL stint in June, Strasburg is already proving when healthy, he belongs atop the ranks of pitchers. We see a few repeating names on those two lists above, as Max Scherzer is #3 in innings pitched and #1 in strikeouts and Madison Bumgarner comes in at #2 in innings pitched and #3 in K’s. Johnny Cueto tops yet another category, earning his workhorse title while pumping out 131+ innings in 18 starts while failing to complete 7 innings just 5 times thus far. Clayton Kershaw and MadBum top this list once again, unsurprisingly. Each of the two southpaws are dominant in different manners, but each are completely irreplaceable as the ace’s of their staffs. Bumgarner might have some competition with Johnny Cueto this year, who ranks 5th in WAR for NL pitchers, but there is no question the 6’5 Bumgarner holds reign over the ace role. The Wins above Replacement statistic is relatively new in baseball, but is generally regarded as an even playing field number that can give a strong look into an individual player’s performance. ** An interesting statistic I found in ESPN’s Sabermetrics was the Tough Losses category. Madison Bumgarner claims 3 tough losses and 0 cheap wins, among the worst spreads in the MLB. We have seen a few instances of the San Francisco bullpen blowing a lead that MadBum had given them, as well as seen the Giants offense sputter and let down their ace. For example, on June 20th, Madison pitched a complete game in Pittsburgh allowing just 5 hits and 1 run, striking out 8 and walking just 2 while earning a tough loss 1-0. If this was the end of the year, and I needed to put a vote in for the 2016 NL Cy Young award, my vote would have to go to Clayton Kershaw. Not by a wide margin, however. I strongly believe a big second half from Madison Bumgarner will push him over the top and allow him to win his 1st career Cy Young. But right now, Kershaw is leading the MLB in ERA, WHIP, WAR and is a top 5 winner thus far, if you put any stock in pitcher wins. He has been dominant throughout 2016, but it isn’t exactly his race to lose this year. Bumgarner, Johnny Cueto, and yes even Stephen Strasburg and Jake Arrieta all have legitmate chances to garner votes at the end of the year. If Strasburg sports a record nearly as pristine as his 12-0, it’ll be hard to ignore. Arrieta I believe will find his mechanics and confidence and begin to show his 2015 self once more, and I see more of the same from Johnny Cueto and Madison Bumgarner continuing out in San Francisco. If you’re a fan of pitching, the 2016 National League is providing serious entertainment for you. Stay tuned through October, folks! Break Up of Yankees’ No Runs DMC?